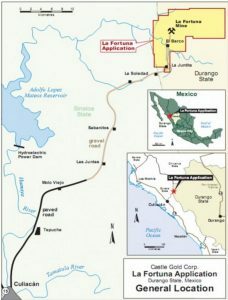 MEXICO – Minera Alamos of Toronto has said it has engaged Especialistas en Ciencias de la Tierra, an earth sciences specialist, to complete the detailed work for the tailings management area at the company’s La Fortuna gold project in Durango. The completion of the final tailings study is said to be a major milestone for the project. Osisko Gold Royalties entered a strategic alliance with Minera Alamos last May with the intention of fast tracking the project – compressing the development schedule once a positive construction decision is made. Osisko purchased 22.0 million common shares for $3.3 million. In June 2017, Alamos closed a $5.4 million private placement with which to fund work at La Fortuna. The La Fortuna site is an intermittent former producer. The current measured and indicated resource at a 0.5 g/t cut-off is estimated to be 4.8 million tonnes grading 1.99 g/t gold and containing 308,100 oz. More information is posted at www.MIneraAlamos.com.